No More Automatically Promoting Facebook Page Posts? Facebook appears to be removing the option for page administrators to automatically promote new page posts. 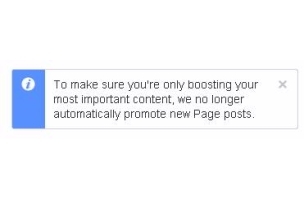 To make sure you’re only boosting your most important content, we no longer automatically promote new page posts. Page admins: Did any of you automatically promote page posts? Are you seeing the same message?